Installing a Graylog2 log management platform for collecting, indexing, and analysing data. Graylog v1.3.x was referred to as Graylog2. We use separate logical volumes for the mount points outlined below. Note that volume sizes vary between systems and highly depend on the amount of logs that you are going to send. We have SELinux set to enforcing mode. The only important thing for Elasticsearch is that we set the exactly same cluster name (“cluster.name: graylog”) that is going to be used by Graylog2 in the Elasticsearch configuration. Elasticsearch has to keep a lot of files open simultaneously and requires a higher open file limit that the usual operating system defaults allow. We are going to configure the security limits file /etc/security/limits.conf to allow up to 64000 open file descriptors. We find it very helpful for development when there is a need to reset the database. Current stable MongoDB at the time of writing: v3.2. Configure SELinux to allow MongoDB to listen on port 27017. The default discovery mode is multicast. Graylog will try to find other Elasticsearch nodes automatically. This usually works fine when everything is running on the same system but gets problematic quickly when running in a bigger network topology. Documentation recommends to use unicast for production setups. Retention strategy depends on requirements. In our case, we have allocated 100GB to the elasticsearh mountpoint /var/lib/elasticsearch and are going to configure Graylog with that number in mind. We want to rotate the currently active index when it reaches 10GB (approximate), and we want to keep 9 indices in total. When the maximum number of indices is reached, we want to delete the oldest one. This will allow a use of 2GB of memory. The web interface will listen on port 9000. Point your browser to it. Log in with username admin and the password you configured at root_password_sha2 in server.conf. This entry was posted in Linux, Monitoring and tagged CentOS, Elasticsearch, Graylog, Mongo. Bookmark the permalink. If you notice any errors, please contact us. Great tutorial on installing Graylog, thanks! 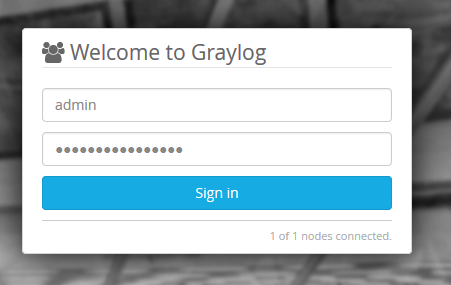 Although this solution works for most, there is an alternative that comes in handy when Graylog doesn’t work out for any reason: it’s NXLog, another open source, centralized log management system, available for free – https://nxlog.co/products/nxlog-community-edition – and since it provides unmatched scalability while keeping up the high-performance, and it’s able to collect logs from Linux, Windows, Android and other operating systems, it can really be a good tool to if these features are required. I don’t mind sensible promotion, but I would like to disagree. NXLog CE is a free log collector and I use it myself to send Windows Event Logs to Graylog. This is the area where NXLog CE works great. However, NXLog CE is just a log collector (I think of it as a syslog-ng server). Unless you use it together with Kibana and Elasticsearch to search and visualise data, I just cannot see how it can be called an alternative to Graylog. An alternative to Graylog would the ELK (Elasticsearch/Logstash/Kibana) stack, or the Elastic Stack. I deployed and tested several open source log management systems (NXLog CE included) trying to pick the one that met my requirements, and Graylog topped the list. I really liked Kibana, but it didn’t have a built-in LDAP support back then, and I also had to write an init script to be able to start the service.